Vertical Blinds are probably the most versatile solution to sun shading problems. 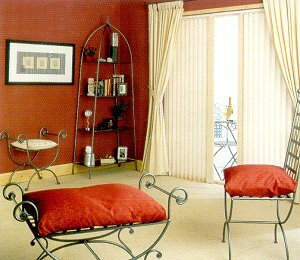 Tones, textures and contemporary weaves in a palette of colours will enhance the decor of any room in your home. We have an extensive range of colours to choose from, the subtlety of natural tones to vibrant purples and blues, vertical blinds are perfect for patio doors as well as most windows. Two vane widths - 127mm and 89mm - will give you even more options when considering your style of window coverings. Some even have matching roller and pleated blinds.